Any information can be placed in the sidebar to help your website visitors navigate your site. To make a boxed heading like the one above, simply apply the H3 tag. To make a box like this, assign the "sidebarlt" class. You can do anything with a sidebar box. Insert images, ads or other web content. To make a box like this, assign the "sidebardk" class. Below, you will find a list of necessary vocabulary for talking about drama and Shakespeare. This list is a work in progress. The list has been alphabetised. Let me know if you have additions to the list - or amendments to the descriptions. Act: Shakespeare's plays are usually divided into five acts - which are subdivided into scenes. There was not necessarily any clear division between the acts in a performance. Alliteration: Repetition of consonant sounds. A device related to rhyme. "I am Fortunes fool." Antithesis: An opposition. Shakespeare often used antitheses (pl.) to express confusion and conflict. Example: "Not having that which, having, makes them short. Aside: A line spoken to one or more characters which cannot be heard by the remaining characters. An aside can also be addressed to the audience. Bathos: Low comedy. Sexual jokes etc. Blank verse: Unrhymed iambic pentametre. Carnival: A masquerade in which people dress up. Kings dress up as beggars - and peasants dress up as kings. In literature the Carnival Motif is when roles are inverted - often with a humorous effect. In Romeo and Juliet, for instance, the nurse dresses up as a Lady - and appears ludicrous because she does not know how to behave in that role. Catharsis: Why watch a tragedy that will make you cry? Aristotle defined catharsis as a relieving of emotional tension, or a purging of emotions such as pity or fear. Catharsis is a positive experience that is brought about when we watch something tragic. Through catharsis, we experience that our own problems are easily overcome compared to the ones we see on stage. Chiasmus: A rhetorical device in which the second part of a phrase is balanced against the first part - but is inversed. Example: "and as soon moved to be moody, and as soon moody to be moved." Notice the words moved and moody that are repeated, but change places in the sentence. Chorus: The character who speaks the prologue - and often the epilogue. Clown: In Shakespeare's plays, the term "clown" is most often synonomous with "fool". Comedy: A drama that is light, humorous and satirical in tone and often ends happily. Conceit: With regards to literature, a conceit is a elaborate and fanciful figurative device which often incorporates metaphor, simili, hyperbole or oxymoron. A conceit is intended to surprise and delight by its wit and ingenuity. Sometimes a conceit is called an "extended metaphor". Dialogue: When two or more characters talk with each other. Dramatic irony: Dramatic irony occurs when a situation is understood by the audience, but not by the characters on stage. At the end of Romeo and Juliet, for instance, there is dramatic irony. Romeo thinks that Juliet is dead, but the audience knows that she is only in deep sleep. Romeo's suicide, thus, seems unnecessary and ironic. Read more about irony here. Epilogue: Usually spoken by a main character at the end of a play, the epilogue concludes the play and is often an apology for the play - or a request for applause. Exit/Exeunt: "He/she leaves." "They leave." Foil: A character that works as a contrast to another character may be termed a "foil". Foil, thus, is an important dramatic tool. Fool: A type-character often kept at court to entertain the nobles. There were "wise" fools, intelligent men hired for entertainment purposes, and natural fools - idiots kept for amusement. Shakespeare's fools are usually "wise". Foreshadowing: When characters on stage say something that hints at something that will happen later on. When Romeo leaves Juliet at her window at the end of Act 3, he says: "dry sorrow drinks our blood". This is a foreshadowing of their deaths at the end of the play. 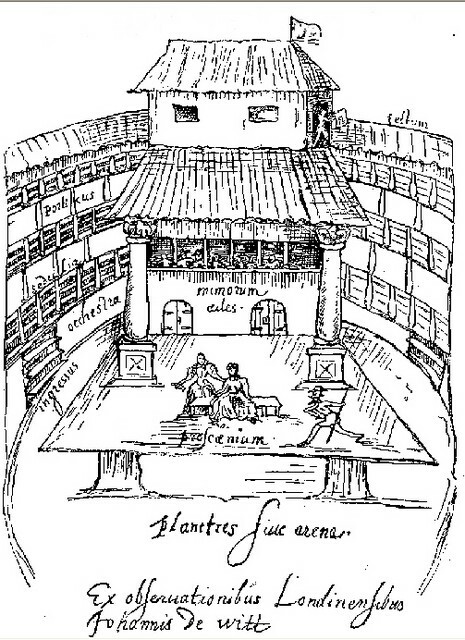 Groundling: A condescending term used to refer to the standing audience in the open courtyard. The groundlings' tickets were the cheapest around. They usually cost one penny. Humorous Device: Humorous devices are methods used to make something funny. Read about some of them here. Hyperbole: Figure of speech based on exaggeration and exaggerated images. Metafiction: Metafiction is when fiction talks about fiction. When Shakespeare's characters talk about "the stage" etc., these lines are essentially metafictional. The puritans in London criticised the plays for being manipulative and illusionist. Metafictional lines were among Shakespeare's ways of showing the puritans that his plays were merely stories - and not "trickery" or "The Devil's work". Monologue: A line spoken by one person. Oxymoron: A form of antithesis where the opposing words are placed next to each other. It makes a very strong image. Example: "loving hate". Pathos: Strong emotion. Often used as a comic device, because exaggerated emotions are often funny. In Shakespeare's works this comic device is most often employed in connection with lower class characters who accidentally make themselves appear hilarious. Personification: An image where things/ideas etc. are given human feelings or attributes. Example: "Love, so gentle in his view, should be so tyrannous". Prologue: The introduction to/ presentation of the play. Often given to the audience by the character "Chorus". Often in verse. Prop: Shakespeare's plays made use of many props on stage. Among the props were swords, shields, crowns, blood bags, cut off limbs etc. Read about special effects here. Prose: Shakespeare moved between verse and prose in his plays. Prose is characterised by run-on-lines of varied length, no rhyme and no metre. Shakespeare usually has the lower classes speak in prose. Prose is also used when the characters talk about the menial things in life. Pun: Word play that makes use of a word that has several meanings. Often Shakespearean puns are bathos - sexual innuendoes. "I saw no man use you at his pleasure." Repetition: Repetition was a favourite device of Shakespeare's. He used to repeat words or phrases to add drama and contrast to the plays. "Do you quarrel, sir?" / "Quarrel, sir? No, sir." Rhyming couplet: Shakespeare often used a rhyming couplet (two rhymed lines) to indicate something important in a play - or a shift on stage, for instance an important character entering the stage, a scene/act ending etc. Scene: The subdivision of an act. There was no marked division between the scenes in an Elisabethan performance. Simile: A comparison that uses "like" or "as". Example: "My bounty is as boundless as the sea, / My love as deep". Soliloquy: A line in which a character talks to him-/herself and reveals his or her private thoughts. Convention dictates that other characters on stage cannot hear the soliloquy, but usually the character is alone on stage. Sonnet: A Shakespearian sonnet is a 14-line poem in iambic pentametre. It consists of three quatrains and a concluding couplet. The rhyme scheme is ABAB CDCD EEF GG. A sonnet is usually a love poem that is divided into three parts 1. Exposition/ problem, 2. Volta/ turning point, 3. Conclusion. Stage direction: The kind of dramatic discourse that gives the director and/or actors information relating to the performance of the play. Eg. who is on stage? What does the character do? How is a line delivered? etc. Shakespeare's stage directions were fairly limited. Tragedy: A drama in which the main character suffers extremely as a result of his tragic flaw. Shakespeare's tragedies also have comic scenes. Sometimes these scenes are a kind of "comic relief", but in most cases they are in the plays because Shakespeare had to cater to a very varied audience. Verse: Shakespeare moved between verse and prose in his plays. Verse is characterised by rhythm and metre. Shakespeare's verse is written in iambic pentametre. Sometimes the lines are rhymed - usually to indicate a particularly important point, or the end of a scene/act. Verse is usually reserved for the higher classes among the characters - or for people who speak about lofty topics such as love.